The figs that I used for this recipe were collected from a plant that was spontaneously born many years ago along the river that borders our property. The site is not suitable for the fig tree because it has its roots near the water and does not get much sun due to the shadow of large poplars above it. The combination of a radical winter pruning of the trees nearby and dry summer, have favored a good ripening of the fruit this year. These are very small and black figs. They have a thin skin and are truly delicious. I tried this recipe, taken from the magazine “La Cucina Italiana”, a few nights ago when I was hosting a dinner for my friend Maria Rosa. I wanted her to taste these delicious figs. If you have personally collected figs from the tree, you do not need to peel them, otherwise you should. Cut the figs in half. Add the the wine, orange peel, and 2 tablespoons of sugar with the vanilla into a saucepot. Bring to a boil and simmer until the liquid is reduced by half. Meanwhile while you reduce the wine, caramelize the figs. Add the butter and the remaining sugar to a nonstick pan. When the butter has melted, stir the mixture and add the figs with the cut side down. Cook for one minute, then gently turn the figs and cook for another minute, if necessary add 2 tablespoons of water. 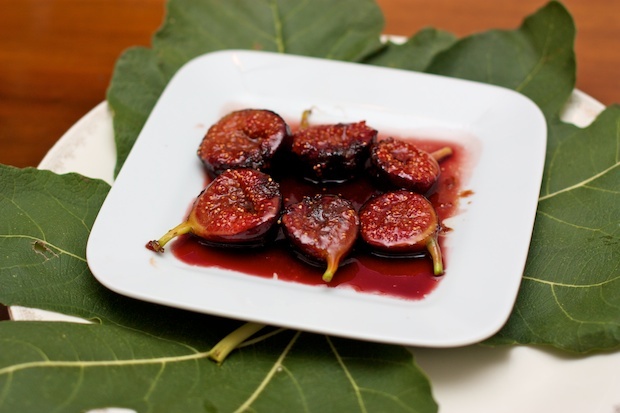 Place the figs on individual plates or bowls, pour over each serving a little cooked wine. Serve immediately. If you want to enrich this dessert, it can be served with a scoop of vanilla ice cream.